Every year, I make the mistake of going blackberry picking in shorts. The thorns on the blackberry canes are fine – I can avoid those – it’s the nettles that always seem to grow around them that get me every time, but foraging food isn’t meant to be easy. You should put a bit of effort in if you’re going to get something for free, and maybe experience a touch of outright pain as part of the deal, too. The blackberries are worth it in the end. This year, my favourite bushes, in an undisclosed secret location, were weighed down with a good mix of large, plump berries, juicy and mild in flavour, and much smaller, tart berries, hidden away under the top layer of leaves. Perfect fruit. This Italian blackberry tart is a great place to start making inroads into your haul. It uses a fairly standard shortcrust base, packed with berries and topped with frangipane. The basic components and principles are endlessly versatile and will accommodate most types of fruit. Dried apricots are sensational, as are apples, plums and cherries. Pears are a little…whatever. The pastry case needs to be started the day before. Actually, it needs to be frozen solid, so you can make it weeks in advance if you’re particularly organised. Cooking a pastry case from frozen pretty much guarantees no shrinking. Blend 250g of butter, 200g of icing sugar and a pinch of salt in a food processor until the mixture is light and a little fluffy. Pulse in 500g of plain flour and four egg yolks. You’re aiming for a mixture that looks like – yes, you’ve guessed it – fine breadcrumbs. I normally scrape the creamed together butter and sugar into a very large bowl and rub the flour and egg yolks in by hand, because my food processor isn’t quite big enough. Add a splash of milk and bring the dough together, then mould it into a fat cylinder, wrap it in cling film and refrigerate it for at least an hour. The trick here is not to overwork the dough. Grease two 30cm tart tins, the type with fluted sides and removable bases, with butter and then line the tins with slices of the rested dough, so that the base and sides are more or less covered with discs of pastry. All you need to do now is to gently work the pastry into place with your fingers, pushing the pastry pieces together and pressing them against the sides of the tin. Trim excess pastry away from the rim with a knife and put the lined tins into the freezer. To make the frangipane – an almond paste that’s the heart and soul of many a torte – just blend together 100g each of ground almonds, plain flour, caster sugar and unsalted butter, and then add four medium eggs, one at a time. When you’re ready to make the tart, preheat the oven to 180c, then get one of the pastry cases out of the freezer. Working as quickly as possible, spread a layer of blackberries out on the base of the still-frozen case, packing the fruit in tightly in a single layer, then drop spoonfuls of frangipane over the top. Use about half of the frangipane – the other half will freeze well – and don’t worry if the fruit isn’t totally covered. The frangipane will rise and expand like an out of control mutant life form to fill the gaps and wrap everything in a sweet filling. Put the tart in the oven for thirty minutes, then lover the temperature to 150c and bake for another forty-five minutes. The first hot blast cooks the pastry and sets the frangipane, the second longer and gentler period lets it all dry out nicely. Let the tart cool completely before taking it out of the tin, then dust with icing sugar and serve in triangular slices. , which was first published in 1996. It’s a wonderful cookbook, full of Italian classics that are as relevant now as they were in the nineties. Got loads of blackberries down the allotment, so will give this a go! This tart is absolutely perfect! How did you get such a clean slice? I have wonderful memories of picking blackberries with my grandparents when I was a child. However, we never made anything as tempting as this tart. Lovely tart. And I agree picking wild blackberries for free is worth all the effort. a perfect tart with those luscious blackberries! what a great crust, sounds like a wonderful recipe! Thanks so much for sharing it with us! This looks very elegant and absolutely delicious! Very elegant tart! Blackberries are marvelous. This tart looks gorgeous! Now I'm really wanting some blackberries! Will have to grab some next time I'm at the grocery store and give this recipe a try. The frangipane is genius. Blackberries and almonds, a winning combination. My only problem is, do I go for this recipe or crumble . . . decisions, decisions! As a child my Secret clump of Blackberries was one of my favorite places. I wish I had known about crostata then. This looks yummy. 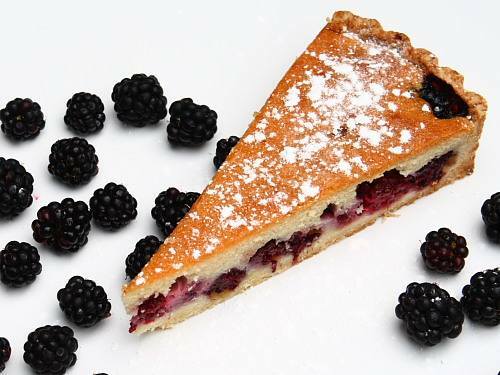 This tart looks amazing and well worth the blackberry picking work 🙂 My husband would absoultely love it…blackberries are his favorite fruit. Absolutely gorgeous. I love blackberries too but find that it's the mosquitoes and poison ivy that get me when I go picking them. Thank you for sharing this wonderful recipe with us. Your blackberry tart looks so elegant. Thanks for sharing your recipe. 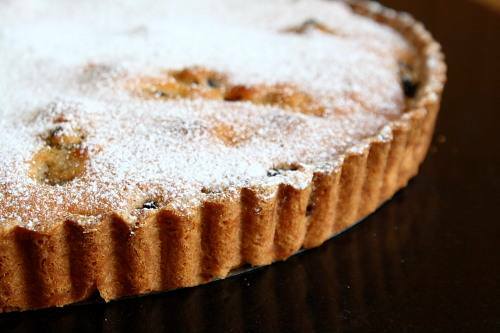 This is a truly lovely tart, and so beautifully depicted in your photos. Wondrous! Lovely photo's and even lovelier crostata. Great recipe with wonderful photos. Love the use of the blackberries. Beautiful tart, and I just went blackberry picking also. Thanks so much. Oooh I love this crostata! What a great recipe! And now I need blackberries (a favorite of mine but so hard to find in my part of the world). Just beautiful! Made it this weekend, tasted delish. Theblackberries were a bit sour for my girl but for me the sweet and fruit combination was delightful. this looks so tasty and cozy. blackberries are an incredible treat.